How does self-sufficiency sidetrack you on your weight loss? In your finances? In your ministry? Teresa learned the answers to those questions and more. 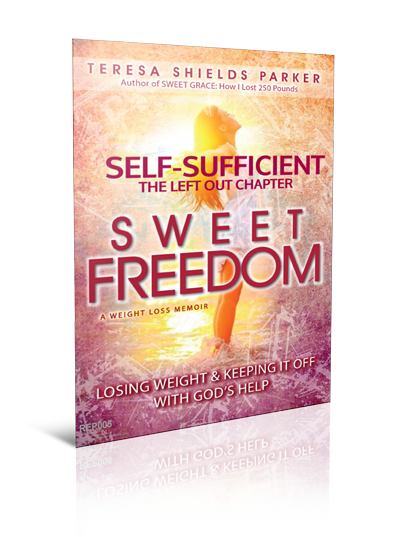 She shares her journey into His sufficiency and out of self-sufficiency. What she shares will help lead you to your own Sweet Freedom from feeling the crushing weight of having to bear the burden of doing it all yourself. This chapter didn’t exactly fit in Sweet Freedom: Losing Weight and Keeping It Off. It is about weight loss, but it’s about a lot more. So, when Teresa found she had to cut her book, she left this great chapter out. She decided to offer it free to give readers a glimpse of what the book is all about. It’s a teaser chapter for those who haven’t read Sweet Freedom, but it’s a bonus chapter for those who have. The best of both worlds, but better than that it’s our gift to you for subscribing to our website. Just sign up below to get a taste of Sweet Freedom.